If you've ever wanted to generate PDFs on-the-fly on your server and wanted to do more than just plain text, PDFB Library just might be what you're looking for. PDFB Library by Chirag Mehta makes it very easy for even novice PHP programmers to generate high-quality dynamic PDF files. The library allows you to take any PDF file, then overlay text, images, and barcodes (Code 3 of 9, Code 128, Interleaved 2 of 5, and UPC-A), and generate a new PDF dynamically. On most servers it requires almost no configuration and as long as the PHP Image library is setup correctly, you're ready to go. PDFB Library has been tested to run on Linux and Windows servers without any problems. Let us take this base PDF as a template. Now write this simple PHP code. Voila! Generate the PDF on the fly! View the ReadMe.txt file for more info. You may choose to download the full demo + working code that you can distribute and modify yourself or you can download the compact working code with a demo that you can use in production environments. Each of these libraries have their own licensing and copyright/copyleft schemes. For license and legal requirements for each of these libraries, refer to the URLs above. The PDFB ElePHPant Logo was created using a template by El Roubio. 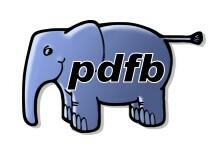 The PDFB Library is released under the Creative Commons license. Download PDFB Library from the links above. Extract to any folder on your server that is accessible by a web browser. Go to demo.php on your server to test it. If you see a PDF, then success! Rejoice! Otherwise spend all night trying to figure out what's wrong. Before you give up, make sure you have PHP Image library setup correctly. For help, documentation, and server requirements for each of the libraries used in PDFB Library, refer to the documentation from the URLs above. For help and documentation on how to use the PDFB Library, view the source-code of demo.php file included in the PDFB Library download above. View the ReadMe.txt file for some more information. Due to time constraints, I cannot write detailed documentation for PDFB Library. However, feel free to email me for further information, technical questions, ideas, improvements etc.